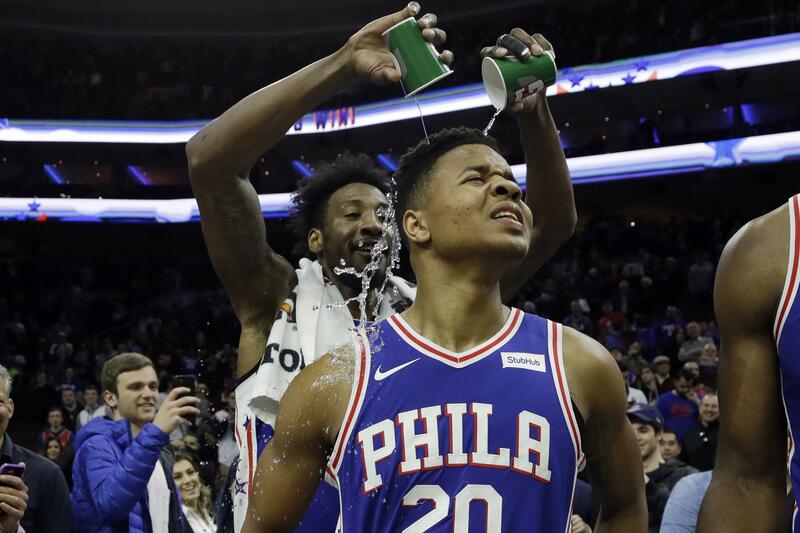 Mon., March 26, 2018, 10:17 p.m.
PHILADELPHIA – Markelle Fultz had 10 points and eight assists in his first game since October, helping the Philadelphia 76ers beat the Denver Nuggets 123-104 on Monday night. The first pick of the 2017 draft shot an air ball, had three shots blocked and artfully attacked the lane, flashing glimpses of what has made him both a mystery project and prominent prospect. With a playoff berth clinched for the first time since 2012, the 76ers and Fultz decided the time was right for the guard to return from an injured shoulder and busted confidence that had cost him all but four games of his rookie season. Joel Embiid had 20 points and 13 rebounds for the Sixers. Will Barton led Denver with 25 points. Selden and Gasol each hit four 3-pointers as Memphis went 15 of 31 from beyond the arc while dealing a blow to Minnesota’s playoff hopes. The Timberwolves (42-33) dropped to eighth in the Western Conference standings, a half-game back of idle Utah. Jeff Teague had 25 points and seven assists for Minnesota, which lost its second straight game and dropped to 6-7 since All-Star Jimmy Butler was lost to a knee injury. CHARLOTTE, N.C. – Kemba Walker had 11 points of his 31 points and three assists in overtime, and Charlotte earned its fourth straight victory. Walker was 4 for 4 in the extra period with three 3-pointers to outduel New York’s Trey Burke, who finished with a career-high 42 points on 19-of-31 shooting and 12 assists. Dwight Howard had 23 points and 13 rebounds for the Hornets. Michael Beasley added 27 points for the Knicks, who fell to 9-30 on the road. PHOENIX – Jayson Tatum scored 23 points, Marcus Morris added 20 in three quarters before leaving with an injury and Boston beat Phoenix. Tatum surpassed 1,000 points for the season, and Boston won its fourth straight to move to three games behind the Toronto Raptors for first place in the Eastern Conference. Morris, a former Sun, re-injured a sprained right ankle that forced him out of the Celtics’ game Sunday at Sacramento. He didn’t play in the fourth quarter. Josh Jackson led the Suns with 23 points. He has scored 15 or more in seven straight games, but the Suns lost their 12th consecutive game and have dropped 27 of 29. DETROIT – Reggie Jackson scored 20 points and Reggie Bullock had 16, leading the Pistons to the victory. Detroit (34-40) won for the fourth time in five games, but trails idle Miami by five games for the final Eastern Conference playoff spot. Published: March 26, 2018, 10:17 p.m.